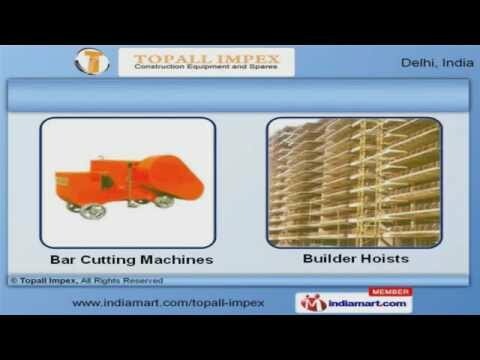 Welcome to Topall ImpexManufacturer & Exporter of Construction EquipmentsThe company was incepted in the year 2008. Our Good financial position & TQM helpus to cater East Asia & Middle East. L&T and Prasad Construction are some of our prestigious clients and we are backed byUnique & sophisticated designs. We offer a wide assortment of Concrete Mixers, Bar Cutting & Cutter Machines. Our Material Handling Hoists & Bar Bending Machines are widely acclaimed in themarket. Bar Cutting Machines & Builder Hoists offered by us are nothing but the best solution forall your needs. Our Compaction Equipments & Concrete Batching Plants are superior in performance. We also provide Concrete Mixers & Material Handling Equipments that are available atindustry leading prices. Along with that we offer Lab, Testing & Measuring Equipments that are extremelyreliable.